Flerovium is a superheavy transactinide element and was first synthesized in 1998 by the Joint Institute for Nuclear Research in Dubna, Russia, though a repeated synthesis in 1999 was necessary to confirm the discovery. IUPAC did not officially recognize this discovery until 2011, following work by both the UC Berkeley and the GSI nuclear laboratories in 2009 that successfully produced several different isotopes of the element. The element was then named after the Flerov Laboratory of Nuclear Reactions, which in turn was named after the Soviet physicist Georgy Flyorov, whose work and advice to the government of the USSR led to the development of that country's atomic bomb project. The name became official in 2012. The most stable known isotope of flerovium has a half-life of only 2.6 seconds, though it has been proposed that nuclear isomers of this isotope may have longer half lives. Relatively few atoms of flerovium have been synthesized, so its chemical properties are poorly understood, and a matter of ongoing investigation. There are no applications for flerovium outside of basic science research. Flerovium is a P-Block, Group 14, Period 7 element. The number of electrons in each of Flerovium's shells is 2, 8, 18, 32, 32, 18, 4 and its electron configuration is [Rn] 5f14 6d10 7s2 7p2. In its elemental form Flerovium's CAS number is 54085-16-4. Previously referred to as Ununquadium (Uuq) as a theoretical element, Flerovium was officially discovered in 1999 by the Joint Institute for Nuclear Research in Dubna, Russia and the Lawrence Livermore National Laboratory in Livermore, California, USA. Flerovium is a synthetic element that is not present in the environment. Little is known about the element, its appearance is unknown, and it has no known uses. Flerovium information, including properties, research, applications and other useful facts are discussed below. Scientific facts such as the atomic structure, ionization energy, abundance on Earth, conductivity and thermal properties are included. 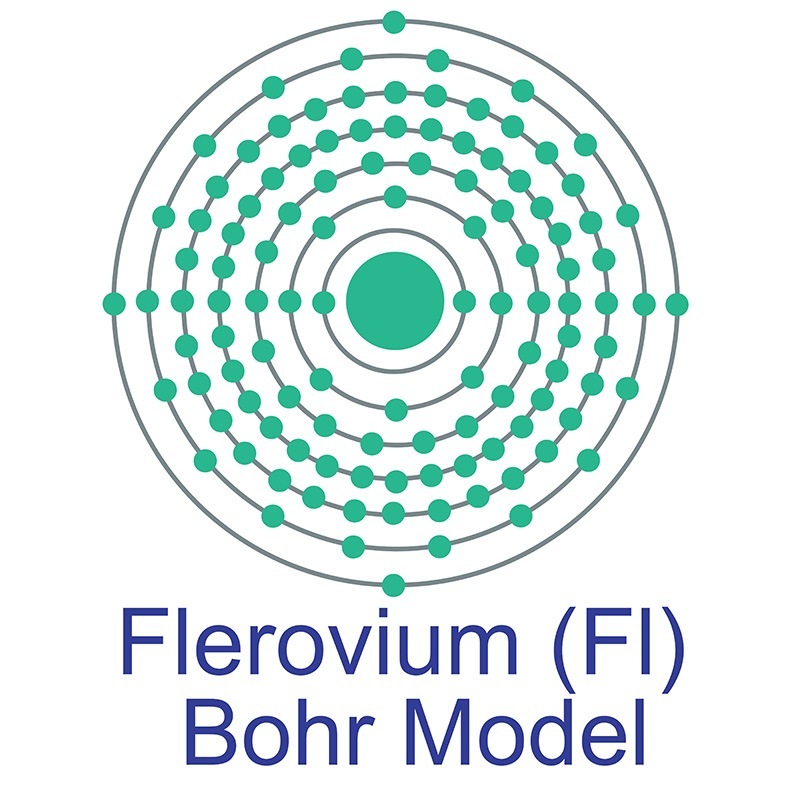 Flerovium is an artificial element. Like all artificial elements, it has no stable isotopes.